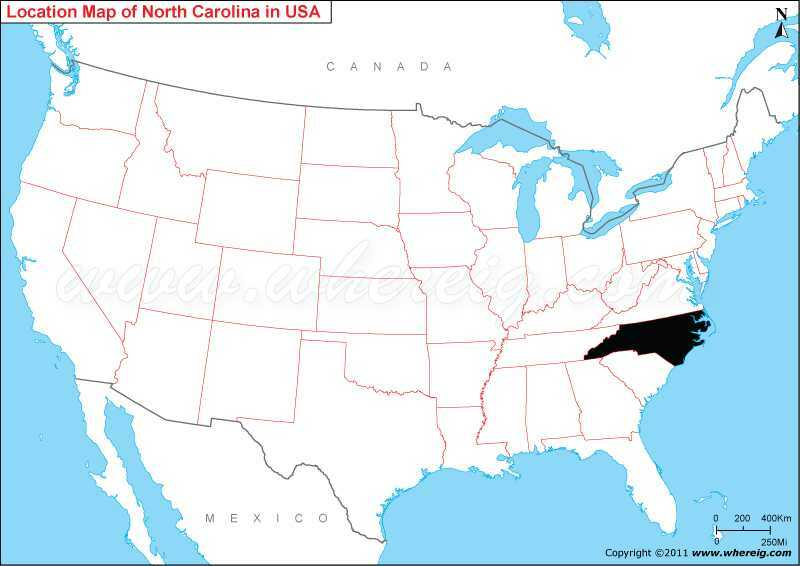 Map showing location of North Carolina Located? As shown in the given North Carolina location map that North Carolina is located in the south-eastern region of the United States. North Carolina map also shows that the state shares its boundary with Virginia in the north, Tennessee in the west, Georgia in the south-west, and South Carolina in the south. Besides, Atlantic Ocean lies in the east of the state. The capital city of state is Raleigh; however, the largest city is Charlotte. The climate type of state is largely humid sub-tropical type. The important economic sectors of the state are agriculture, financial services, and manufacturing. Important agricultural produce are tobacco, hogs, milk, nursery stock, sweet potatoes, soybeans, cattle, and poultry and eggs. And, the important industries are textiles, chemicals, electrical equipment, paper and pulp and paper products.